Broadly speaking, "Pagan" could refer to any person who follows a nature-centered spirituality or religion. This could include not only people such as Druids and Wiccans, but also First Nations (indigenous) people following their traditional religions, practitioners of syncretic traditions such as Santeria and Vodun, and people following such Eastern traditions as Taoism, Shinto, and Hinduism. However, the term is usually used today to refer to people who practice a nature-centered spirituality who are not of First Nations (indigenous) descent and who come from Europe, North America, Australia, and New Zealand. Common facets of Paganism include a focus on divine immanence, a personal commitment to act ethically and cultivate right intention, a belief in acts of art and magic to effect change (using the will to change manifest reality), tolerance for diversity, polytheism (many gods/goddesses) and/or animism (all things have spirits), and equality of genders. Here is a good summary of Neo-Paganism. Druids follow spiritual traditions inspired by the pre-Christian Celtic folktales, legends, mythology, concepts, and practices. Druids may attempt to reconstruct past religious lifeways (from archaeological and historical accounts) or they may take the past as inspiration and create a modern religion or spiritual path from this. How are Druids organized? How do they meet? Druids are organized both in large international organizations and in local groups that practice their religion together. Local groups in Druidry are called “seed groups” or “groves” rather than covens. There are no particular number of Druids who should practice together, so size can range from just a couple individuals to dozens. These local groups, such as our own Star and Stone Fellowship, tend to be close-knit groups that meet regularly for discussion, workshops, magical workings, ritual, and friendship. In addition, larger organizations may host large gatherings once a year for larger ritual, networking, workshops, and sculpting of Druid culture and spirituality. Druids are also generally present at large inter-Pagan gatherings, such as Pantheacon. Please see the Links page for the websites of the international organizations. Is Druidry a religion? A spiritual path? Yes, and yes. For some people, Druidry is a Pagan religion, complete with doctrine (beliefs about the cosmos, divinity, the soul, etc.). For others, Druidry is a spiritual path- a set of tools, techniques, and experiences through which we can grow spiritually- without ascribing to Neo-Pagan beliefs. Thus, in OBOD, one can find Christians, Hindus, Buddhists, and Jews who are also Druids. Most Druids, however, are Pagan. Druids have no particular dogma, so if you ask ten Druids a question, you will probably get eleven answers! However, there are some general commonalities in belief held by most Druids. Druids generally believe that there is no divine judgement. Actions have their consequences, and we are responsible for learning better ways of thinking and acting over time so that we can be of greater benefit to all beings. The gods and goddesses are there for assistance, support, inspiration, and guidance but in polytheist systems, they are not "omni-deities." Thus, the deities are not all-powerful or all-knowing. We act ethically because it is the right thing to do, not because we think we will be rewarded or punished. While specific ideas about the afterlife are varied, most Druids believe in reincarnation. In fact, for many Druids, they believe they are their own ancestors, and their tie to and affection for Druidry is inspired by their own past lives in Celtic spirituality. Most Druids, therefore, are concerned with gaining wisdom, standing for justice, protecting and healing the earth, and learning to love all existences because they know that tomorrow's children will also be ourselves. Thus, we do not need divine reward or punishment as incentive. We are motivated by our own best interest and by a concern for all the beings we live with- now and in the future. Druids do not have something like the Ten Commandments, but they do have distinct values that guide their ethics. Druid ethics are generally eco-centric; that is, Druids make ethical choices based on the good of all beings, not just for themselves or for humanity. Neo-Pagan Druids have traditionally had strong presence in movements such as peace and non-violence, simplicity and green living, social justice, and environmentalism. Druid values include a strong focus on love, creativity, peace, justice, wisdom, and the inherent worth of all beings. Key guides in Druid ethics include the Druid’s Prayer and the Druid’s Vow. And in the love of all existences, the love of the Spirit and all goodness. Confirming this, our sacred vow! What do Druids do? What is Druid ritual like? Druids may have ritual to celebrate one of the eight holidays in the Sacred Earth Year (which helps attune us to the seasons and the cycles of our Mother Earth), to create magical workings for particular purpose, or to simply give thanks to Nature and the Divine. 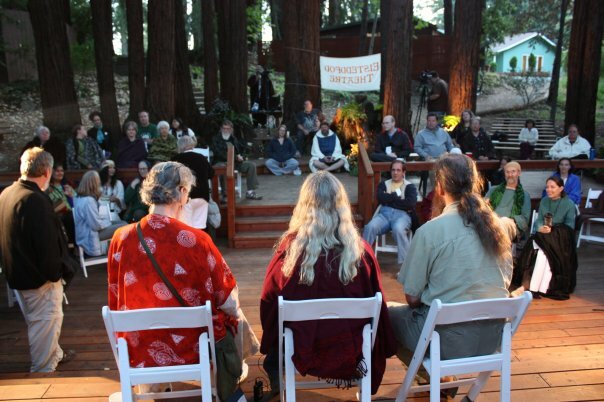 Druid gatherings may also include studies of relevant topics and discussion of our studies, eisteddfod (sharing of poetry, music, and other bardic arts), sharing a meal, and drumming, chanting, and dancing. Druid ritual, as it is practiced in OBOD, is based on a liturgy that includes an opening, a central rite, and a closing. 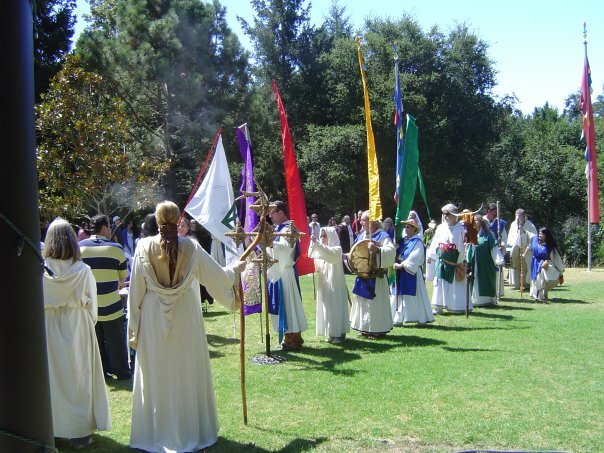 The opening includes such activities as a procession into the circle, casting and consecrating the circle, giving peace to the quarters, opening the elemental/directional quarters, reciting the Druid’s Prayer and welcoming those of the spirit-world, and chanting Awens (Awen is a term for Divine inspiration). The central rite is usually specific to the purpose for gathering. The closing includes thanking the spirits of elements and directions for their participation, thanking the spirits of place and deities, reciting the Druid’s Vow, and chanting more Awens before closing the circle. How is Druidry different from Wicca? Gender and Duality: Wicca tends to be centered on the duality of God and Goddess, and the union of the two. Druidry does not emphasize this duality, being more commonly animist (all living things have spirits), pantheist (Nature is the Divine), panentheist (the Divine is immanent in Nature and also transcendent), and/or polytheist (many gods and goddesses). While Wicca may encompass female-only covens with exclusive focus on the Goddess, this is extremely uncommon in Druidry. Focus on Celtic Pantheon and Spirituality: While Wicca may work with a variety of pantheons (Greek, Roman, Egyptian), Druids tend to be focused on the Celtic pantheons. Druids emphasize incorporating languages, practices, and other heritage specifically from the peoples of Wales, Ireland, Scotland, and England. While this is the case, Druids also believe that one should be inclusive of the place and land one is currently on, and so there are adjustments for local ecology, seasonal cycles, and flora and fauna. Lack of High Priest/ess: Druid groups typically do not have a High Priestess and/or High Priest or any leader at all. Instead, all people of the group share leadership and may take on different roles over time as need, circumstance, and desire dictate. Ritual is led by two or more Druids working together, but these are roles in ritual, not positions in the group, and people take on different roles over time. In most small-group Druid rituals, everyone is expected to have an important role. Ritual Differences: There are also a number of minor ritual differences between Druidry and Wicca, including such things as "crossing the quarters" (going across the middle of the circle) and chanting Awens rather than toning. Traditional Druid robes are white. If I want to study Druidry or become a Druid, what should I do? There are several ways to study Druidry. The best way to approach this is to first review some of the web content of each of the major international organizations and to decide which feels like the best path for you, as each has its own distinct flavor. Then, see what sort of training and study materials are available from that organization. OBOD, AODA, and ADF all offer correspondance courses and online forums for discussion. See our Library and Links pages. Additionally, you may wish to join a local seed group or grove so that you can participate in Druidic workshops and rituals, which can be very helpful. If you have an interest in joining Star and Stone or attending a public event, please contact us and someone will discuss this with you.